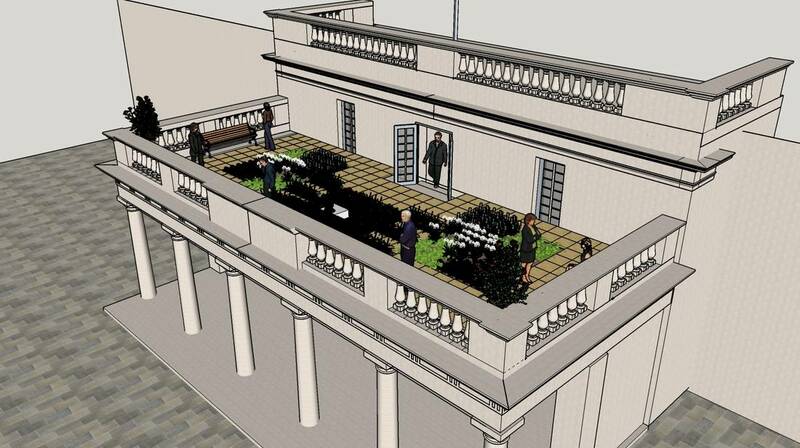 A 3D design of the proposed roof garden setup on the Main Guard in St George's Square. A roof garden will be open at the Main Guard in St George’s Square as part of the Valletta Green Festival which will be running from the 3rd till the 6th May, 2018. St George’s Square, one of the largest open spaces in Valletta, will be transformed into a huge, colourful, floral carpet for this year’s edition of the Valletta Green Festival, organised by the Valletta 2018 Foundation. This year’s edition of the festival, which has been taking place every year since 2015, will be bigger and better than ever. Between Thursday 3rd May and Sunday 6thMay, the square will be completely covered in over 150,000 potted plants, covering an area of more than 1000 square meters, creating a unique colourful atmosphere. This year’s floral carpet invites visitors for a walkthrough, providing a unique experience. A programme of family-friendly activities will be running throughout the whole weekend, offering visitors rare glimpses into some of the capital city’s little-known historical treasures, including the four-hundred-year-old gardens of the Archbishop’s Palace and its Piano Nobile, the garden of St Catherine’s monastery, St Augustine’s church and gardens, and St Dominic’s Basilica gardens. These will be open between 9.30am and 12.30pm and between 4pm and 7pm, from Friday to Sunday. An exhibition will also be set up in St George’s square by various NGOs, including the China Cultural Centre in Malta, WasteServe, ELC and Garby & Tidy, while there will also be entertainment by Xarulu and a short film screening by Solar Cinema. Solar Cinema is also offering stop-motion film workshops for children that bear a green theme thanks to the use of recycled materials. The short films produced in the workshops will be screened on Maltese beaches between May-October 2018 for the children’s family and friends to enjoy! Valletta Green Festival is a fun and accessible platform for initiatives promoting environmental consciousness on the Maltese Islands and a weekend-long festival of activities for the whole family. The roof garden at the Main Guard will remain open till the 13th of May. The project is a Valletta 2018 collaboration with the Maltese Archdiocese, the Ministry for Sustainable Development, The Environment and Climate Change; the Environmental Landscaping Consortium (ELC); the PARKS Department , as part of the Tree 4 U (34U) campaign; WasteServ Malta Ltd; European Green Week and several local environmental NGOs. Description: In Malta, buildings cover one third of the Island, leaving greenery in the dirt track. Green roofs are one way to bring plants back to urban areas with loads of benefits. A green roof will be exhibited on the roof of the Office of the Attorney General to raise awareness and educate the public about the importance of greenery, and how they can implement green initiatives within their homes. Description: Exhibition tents by various NGOs including China Cultural Centre in Malta, ELC, Garby & Tidy and WasteServ. Flower carpet made of flower pots covering an area of more than 1000sqm.